The Pros, the Cons, and the Facts about the Blaze Professional 34 High-End Built-In Luxury Gas Grill. As you design your backyard BBQ area, I have to recommend the Blaze Professional 34-inch grill. It’s a built-in gas grill, which makes it an ideal permanent addition to your outdoor space. Built-in grills are beneficial because they’re anchored, of course, so your grilling area feels more like an outdoor kitchen. More to the point, these grills are powerful. As a whole, this category is full of massive mammoth grills that give off intense heat. Since they tend to be larger than their portable counterparts are, preparing an entire meal is nothing. You’ll unearth a wealth of information in the following Blaze Professional grill review. The details at your fingertips will enable you to decide whether this pick will work for your needs—and your patio, for that matter. Given that the Pro allows you to grill several types of food at varying temperatures and the design specifically minimizes flare-ups, I don’t think you’ll be disappointed. As I believe I’ve said before, I always prefer to pick a grill that lets me do more than one thing. Usually, that means I’m cooking on a combination smoker. Traditional grills are typically just for grilling. That’s all right. Any outdoor chef worth his or her salt can time different proteins and foods. Past a certain point, you can make steak, corn on the cob, baked potatoes, and shrimp on the grill, all at once, and get everything off the heat at the correct time. It’s just a pain because you have to hover over the grill the entire time. That’s fine and dandy—when you want to be standing over a hot surface, babying your food, a beer in one hand a meat fork in the other. I don’t know about you, but I hate doing that unless it’s precisely where I want to be. If I have to stand there for long periods of time because everything will burn otherwise, I get resentful pretty quickly. It’s a horrible thing to get mad at your dinner. I think you’ll find that, for a variety of reasons, the Blaze Pro doesn’t do that. This is my favorite thing about the Blaze Grills Pro, hands down. I’m a fan of gas grills that get it. You don’t want to hover. You don’t want to feel tethered to your grill. 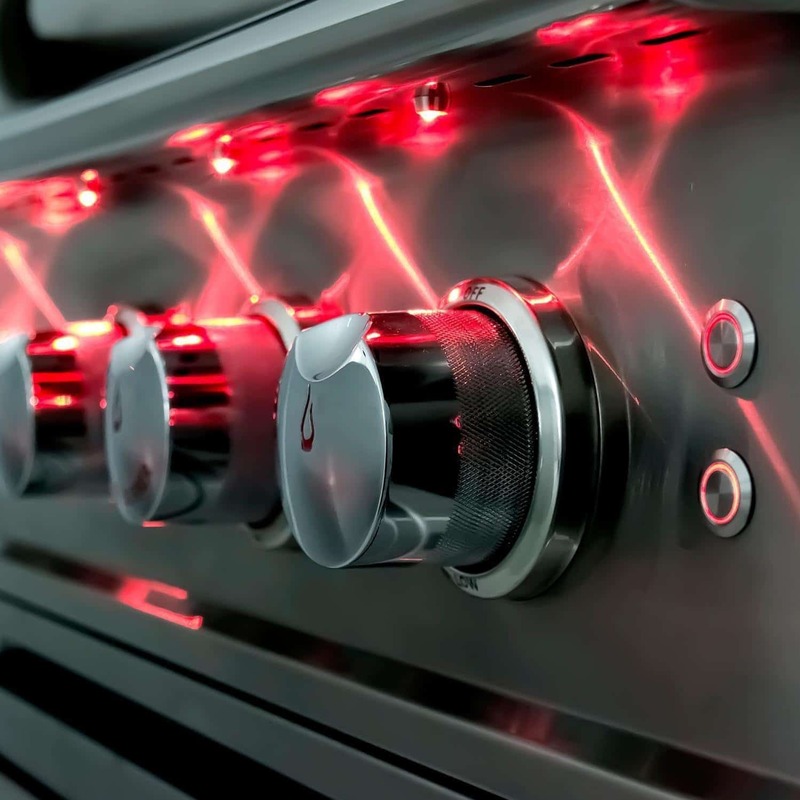 Owing to the design of the Pro, heat zone separators divide the cooking surface. You can set each zone to an individual temperature. As a result, delicate foods, such as fish or even fruit, can cook alongside items that take longer or require a higher temperature. How cool is that? You all know I also prefer grills with less mess. Most grills have a drip pan or at least an inconvenient and cheap little bucket. The drip pan on the Pro runs the full width of the grill. Getting to it is no problem. Emptying it is even easier. The whole process is so fast that, for once, you won’t have to argue about whose turn it is to empty it. I bet you thought I covered this while I raved about the individual temperature zones, right? Nah. The Blaze Grills Professional is even more versatile than that. This model comes with its own rotisserie kit. Rotisserie is the best, and you can experiment with a variety of proteins. The motor is even waterproof, which adds another layer of convenience. This is a small detail, but the innocuous features often mean the difference between making a purchase and moving onto another model. The Pro has interior lights, allowing you to see clearly anytime you grill at night. The knobs are illuminated, as well. That also helps with night grilling, but—not going to lie—it also creates a wicked cool appearance while everyone’s gathered around the patio in the evening. Because the Blaze Professional 34-inch grill runs on gas, using it is practically as simple as igniting it and setting your desired temperature. The primary ignition is in the flame-thrower style. All you have to do is push the ignition button and turn the knob for a quick, effortless start. Just in case, however, the Pro also boasts a secondary ignition. That one is an individual flash tube. There’s always a backup, which is both helpful and convenient. The Blaze Grills Pro isn’t stingy about its value. At this price, this size, and this level, the brand knows that consumers want a monster that won’t let them down when the grilling gets tough. The Pro offers above-average excellence by way of its powerful cook and durable construction. It’s the kind of grill destined to become a permanent feature in your backyard or patio. So, the Blaze Pro has three burners. Again, they’re 304 cast stainless steel—that’s commercial quality right there. Each one, each separate burner, pumps out 18,000 BTUs. Imagine the heat, no better yet, imagine the sear you can get from that. I know you’re never supposed to char your meat. It’s unhealthy for us to eat and it’s bad for the environment—but sometimes you want it anyway, and the Pro will give it to you. That doesn’t even count the power from the rotisserie. It’s good for another 10,000 BTUs all on its own. Forget about rotating Cornish hens on that thing. I dare say you might be able to slow roast a small turkey, and definitely a duck. Don’t knock it ’til you try it. The burners and the rotisserie obviously provide plenty of cooking power. However, the Blaze Professional also has stainless steel cooking rods. As mentioned, they’re hexagons, a shape that lends itself well to durability and strength. Even more than that, the 12mm rods allow you to sear your meat like a pro. The food you pull off the grill is five-star every time. I don’t know if any grill can eliminate flare-ups entirely, but the Blaze Grills Pro gets as close as I’ve ever seen. 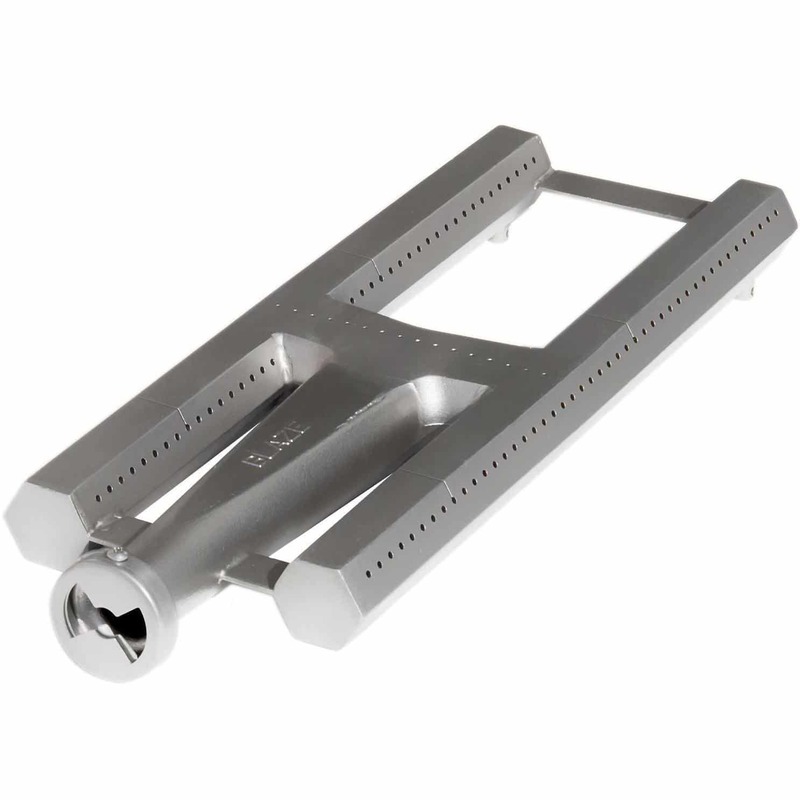 It utilizes grids that are designed to stabilize the flames, which minimizes flare-ups, in turn. The best part? You don’t sacrifice any of the grilled flavors that you love—you know, the whole reason you prefer a gas-fueled grill in the first place, right? Besides the rotisserie, since that’s it’s own thing, the Blaze Professional 34-inch grill has an expansive grilling space. It covers 816 square inches. I don’t think I need to tell you how spacious that is, but I will, anyway. To say the least, there’s room to prepare an entire meal for a sizable group. Obviously, the ability to separate foods into different temperature zones allows you to utilize that space to your best advantage. As I’ve said, I appreciate the small touches. The Blaze Professional’s warming rack is one of those. You’re not likely to need it very often, given your ability to set individual temperatures—can you tell that’s my favorite feature, by the way? However, always be thankful for a specific area to keep food warm without drying out your juicy rewards. Besides, when you don’t need it, the rack is removable. Win/win. Who Is The Blaze Pro For? 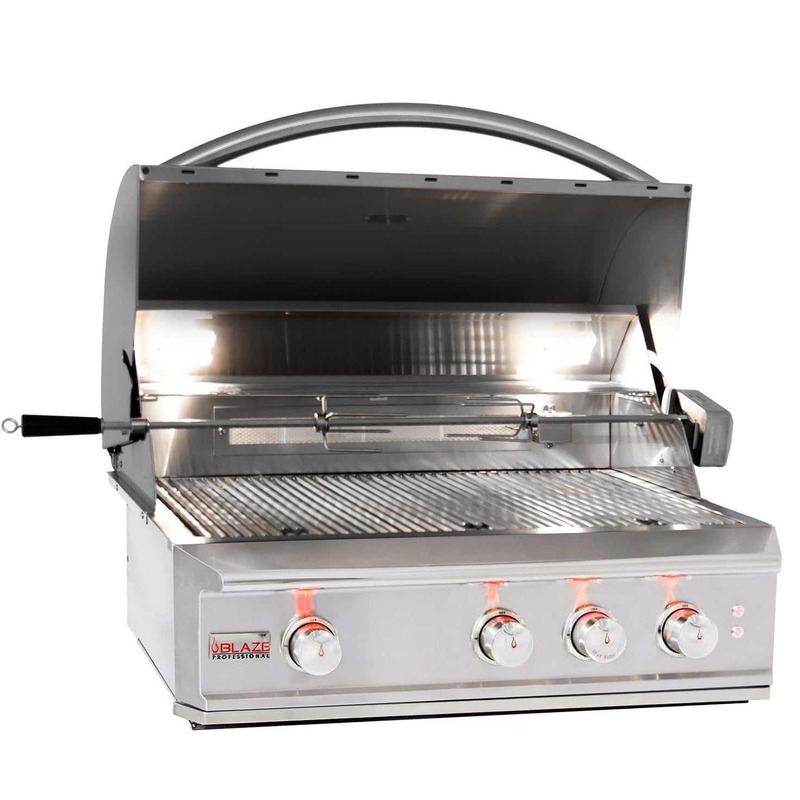 As the name implies, the Blaze Pro is perfect for professional-level cooks and grill masters. However, it’s not just for the pros. Thanks to its ease of use, clear control panel, and easy ignition system, you can master it even if this is your first built-in gas grill—or your first gas grill in general. Don’t let the size or the power intimidate you. Some folks have reported problems with the ignition. It can take more than one turn of the knob to strike and spark the flame successfully. However, cleaning the igniters with sandpaper usually does the trick, and then you shouldn’t have any more trouble. It does have to be said that customer service often tries to help the consumer troubleshoot their problems before offering replacements or fixes. Every grill has its benefits and disadvantages. You can never expect perfection, although it’s understandable that you do. In the interest of full disclosure, here’s a review of the features and benefits that users love the most, and the areas that need some improvement. The recommended price tag on the Blaze Professional 34-inch grill is pretty hefty: $2,799.99. It’s possible to find retailers who offer discounted prices, but you can still expect to pay a pretty penny for a grill of this quality. Blaze Grills offers a best-in-class lifetime warranty on their product, but there are certain limitations. 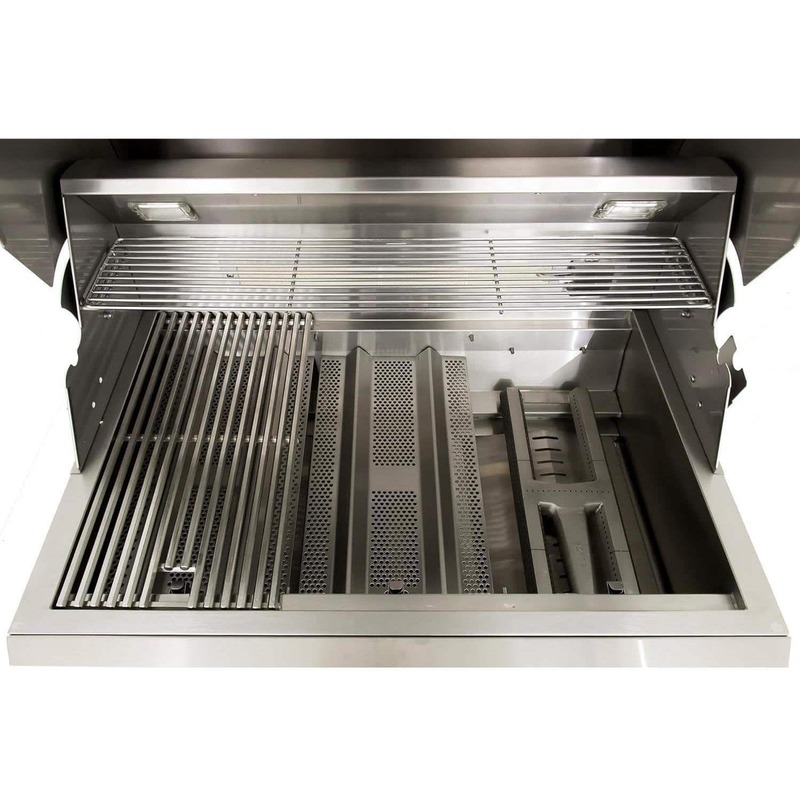 As far as the parts go, the main burners, cooking grids, flame tamers, heat zone separators, warming rack, valves, and the body are protected under the lifetime warranty. Again, that’s only for the parts. The ignition, lighting systems, and electronics are covered for just one year. It’s worthwhile to keep track of your warranty information and to read over it carefully before you call Blaze Grills to report a problem. I haven’t had personal experience with their customer service, but finding opposition to the protection plan is a common theme among the negative reviews attached to the grill. That being said, a search proves that there are very few purely negative reviews, so take from that what you will. 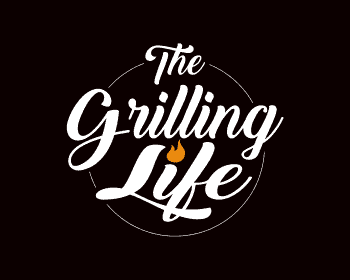 With the exception of the few customer service issues, particularly with regard to problems covered under the lifetime warranty, it’s hard to find any genuinely negative opinions about the grill. The one-year warranty on lighting components is a bummer, but I can’t call it a deal breaker. It’s more of a hassle because the Blaze Professional 34-inch model is a built-in grill, so it’s no simple task to remove some of the parts. The only other downside is the ignition, but few consumers have that problem. It’s negligible enough, and the fix is easy enough that I can’t really count it as a deal breaker, either. It’s the price, however, that might take this grill out of the running for a lot of outdoor cooks, and I get that. It’s a whopper. Then again, it’s a built-in, and as I mentioned, smart shoppers can occasionally find a lower price by shopping around. If you’re looking for a beautiful grill that is exceptionally priced that has luxury features and styling and is backed by a best-in-class warranty, you have got to check Out the Blaze Pro. I hope this Blaze Professional 34-Inch 3-Burner Built-In Gas Grill Review proves helpful for you. As always, if you or someone you know is interested in information on built-in gas grills; please consider sharing with your friends or on social media. I appreciate your support!